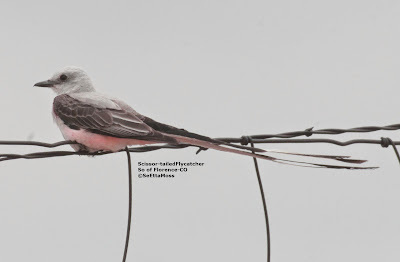 A Scissor-tailed Flycatcher, the first in our county, was found my Rich Miller a little over a week ago south of Florence. I have been jammed with projects and then went out of town so had not gone out to see it. When I read last night that Mike Gaylord had seen two of them I got more motivated to go see if they were nesting as was suggested. 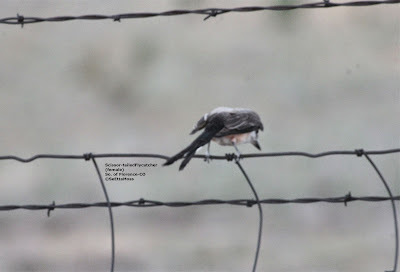 I drove by them a couple of times and pulled over a little when safe (narrow 2 lane highway with dirt shoulders) for a few photos but only saw one bird. I then parked in a pull-out over a hundred feet from the tree where the birds have most often been seen and watched--and it was an overcast morning so it didn't heat up quickly so I watched for just over an hour. After about 10 minutes the second Scissor-tailed Flycatcher flew into the tree where the first was still perched. 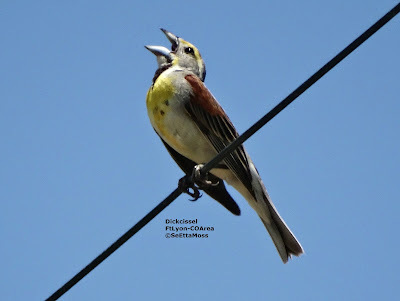 I found a few singing male Dickcissels in the Ft Lyon, CO area on a quick trip to the are on July 3 in an field of unknown plants that they had begun to harvest so I expected that the Dickcissels would be displaced and leave. On my way down to Lamar this past week I drove down the road where I had seen these and was surprised to hear Dickcissels singing in the field, this one with the more expected alfalfa, next to the one that they had been in previously which was now completely mowed to the ground. It was close to dark so I didn't stay long but with plans to return while down in the lower Arkansas Valley. I returned with local birder Jill from Lamar and we enjoyed not just hearing them but watching them as they perched on top of the utility wires as well as tall vegetation to sing. The photo below is a female Dickcissel, which I only infrequently see and rarely get to photograph. The sun was so bright that it really washed out the photos of her.